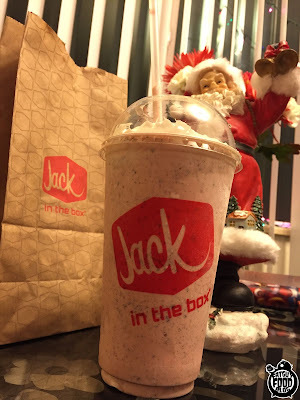 Jack in the Box Peppermint & Oreo Milkshake! Merry Christmas and Happy Holidays to all of our readers! Our gift to you? 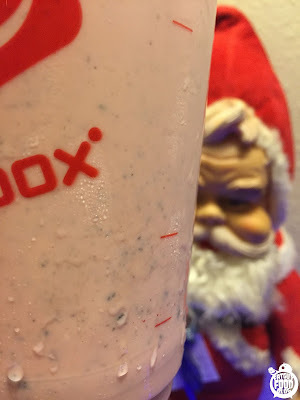 A special CHRISTMAS DAY REVIEW from our friends at Jack In The Box! Today we take a moment from our holiday cheer to tell you about the new Jack in the Box Peppermint & Oreo Milkshake! That whipped cream is beautiful! 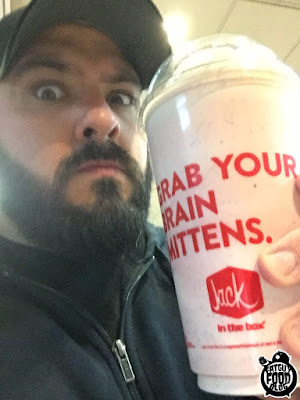 I was looking for a ice cold tasty treat while finishing up my shopping, so I swung by my local Jack in the Box and picked up one of these. Oreo? Peppermint? I LIKE BOTH OF THOSE THINGS! So how could I go wrong? Since the winter in Seattle means non-stop rain, I waited to crack into this cup full of holiday cheer until I got home. Well, that and I tried to take a sip and couldn't get one. I figured the straw was probably clogged with Oreo. This is an okay problem to have. But when I got it home, (along with the other items I purchased) I found something to be amiss...the straw wasn't just clogged, the shake was too thick to drink! Now I know a lot of people prefer this and like to eat them with a spoon. Me? Not so much. Almost popped something in my brain trying to take a sip! So I let it sit for twenty mins and then it was perfect. It's just what you expect. A lovely mix of ice cream, peppermint and tons of crushed up Oreo cookie. How much? So much that my creepy little Santa was quite impressed by it. They definitely didn't hold back on loading this thing up with Oreo. Every single sip flooded my mouth with a cookies worth of Oreo chunks! From the outside of the cup I was worried because the ice cream hides the amount of Oreo quite well. But fear not, my friends! 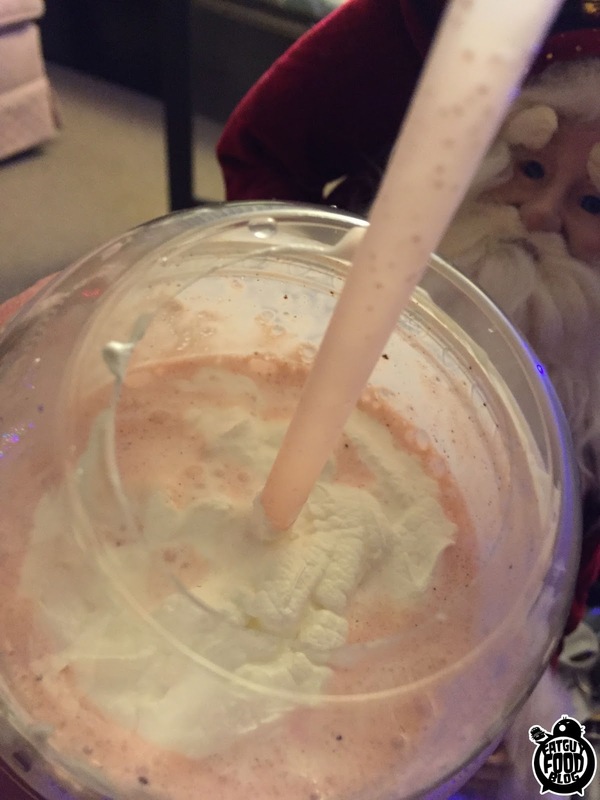 Not only that, but the Peppermint flavor was quite nice and distributed throughout the shake perfectly. 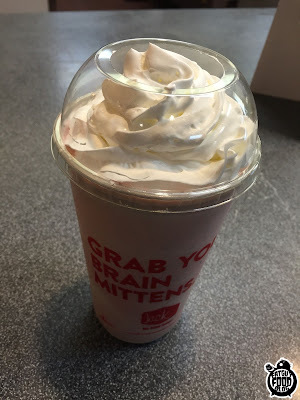 The Jack in the Box Peppermint & Oreo Milkshake is only around for a limited time, and with today being Christmas Day, I wouldn't expect it around TOO much longer, so get out there and get one while you can. 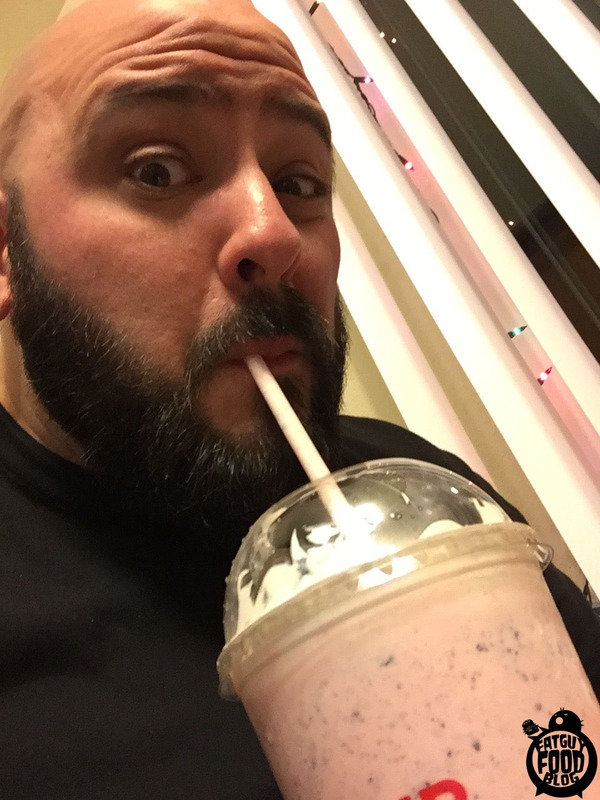 Apart from some initial problems with the shake thickness, after it melted a little bit, I enjoyed it! It's a great holiday treat. Unless you're outside spending time in the cold. I'm giving this shake a B+! 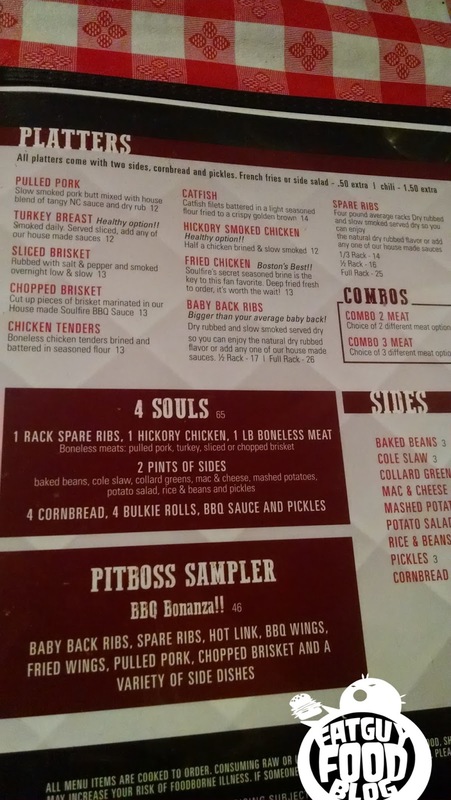 Soulfire BBQ in Allston, MASS! Quite recently I was disturbed to see a review for a hoity-toity, highfalutin, what-in-tarnation-the-dang-heck-is-this vegetarian bistro on our site. I could barely bring myself to read it, afraid that some kind of traumatic brain injury had suddenly afflicted Josh that would only become more apparent as I read on. Before I did, I decided to head out to my local meat shack in sunny Allston, MA, in a hasty attempt to regain credibility with our dear readers. Later I actually read his review and was actually quite pleased to see its meager C- rating. I should’ve known Josh wouldn’t have let me down like that! But at least the experience got me out to try a place in my ‘hood I’ve wanted to try out for a few months now. 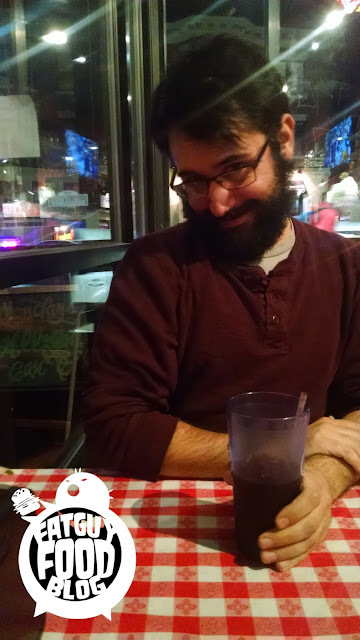 Ladies and gents, I present Soulfire BBQ. I’ll start by saying this- if this review sways you to check the place out, you need to walk to it on the side street behind it. Not only will you avoid the riff-raff on one of the grungiest streets of Allston, Harvard Ave, you can enjoy one of the most pleasant smells known to humanity; the entire neighborhood smells completely of smoked meat. For those of you who have no clue what Allston is (99% of our readers, which equals out to about 4.8 readers), it’s a neighborhood in Boston on the B branch of the Green Line, close to Boston University. If you find yourself in the city looking for quality grub but less crowds, it really is a great place to check out. Soulfire BBQ sticks out like a sore thumb on Harvard Ave amongst the mind-bogglingly numerous Korean restaurants and dive bars. And as I said before, take the right streets to get there and you can Toucan Sam all the way there. I looked over the menu, salivating as I looked over all of the tried-and-true BBQ classics- ribs, steak, wings, etc. Then I saw something that caught my eye. A Reuben sandwich. Stay with me here, folks. Not just any Reuben sandwich, a Reuben with an intriguing twist. It had all the necessities- marble rye, coleslaw, and thousand island, but in place of pastrami these crazy BBQ brains replaced it with brisket!! I said to myself, hey, why not. 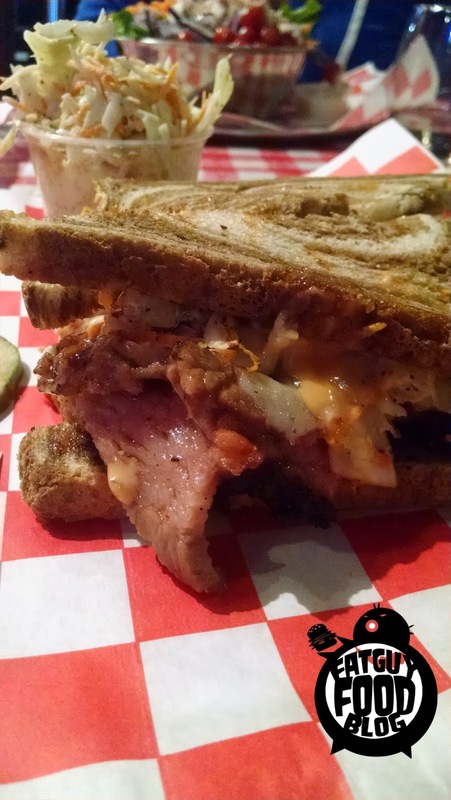 I like Reuben sandwiches and I like brisket. 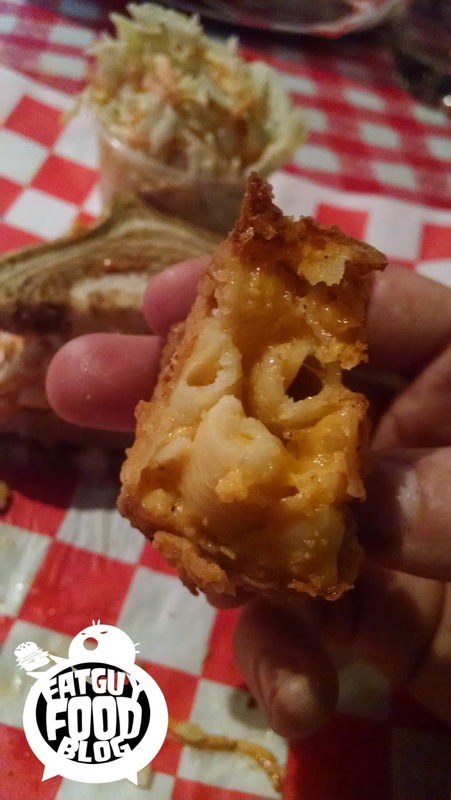 And if that’s not fat enough for the FGFB I’ll start myself out with some FRIED MAC+CHEESE, a novelty food so delicious it should be renamed God’s Testicles. That’ll do the trick. But these didn’t look like omnipotent testes at all, for they were SQUARE!! 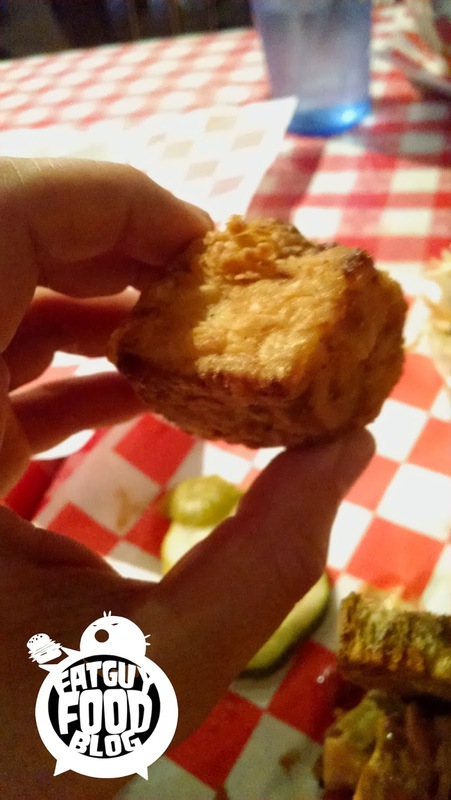 SQUARE FRIED MAC AND CHEESE NOW I KNOW THIS PLACE IS KOOKY!! Kooky it was, reader. Because when I bit in to that thing, I wasn’t instantly covered by the cheesy Charlotte’s Web I had imagined when I ordered it. No, no. Disappointingly in its place I found only macaroni with cheese so sparse you would’ve thought it was a dystopian era of cheese Prohibition! And the restaurant was right across from the old-tyme police station! And a time-travelling cheese bandit had broken down his time machine there and decided to hit the place while he was salvaging parts! But, being the resourceful gentleman I am, I decided to use the disappointing Mac squares as a vehicle for sampling the five BBQ sauces provided on our table. 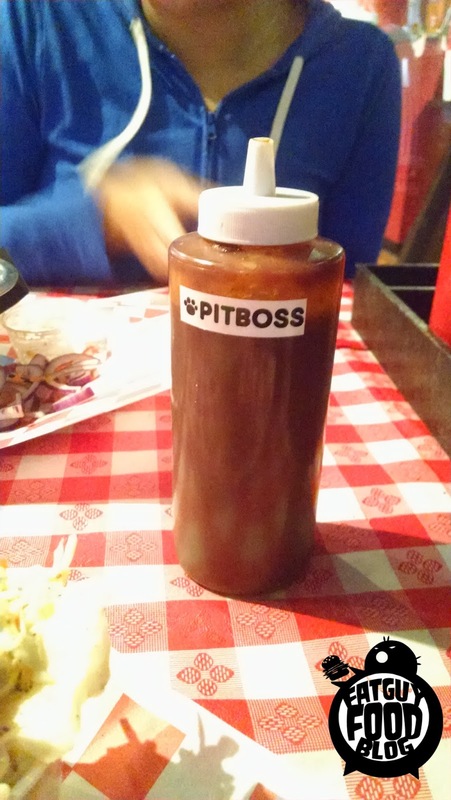 There emerged the real star of this show, a truly delicious BBQ sauce known only as “Pitboss”. And call the pitboss I did because I had hit the jackpot of BBQ sauces. This BBQ sauce was so good the time-travelling cheese bandit tasted it and decided to give up his queso-hunting career, broke his time machine, and become a server at Soulfire where he could eat it any day to his heart’s content. Yeah- it’s a really good BBQ sauce. Then came out my Reuben. 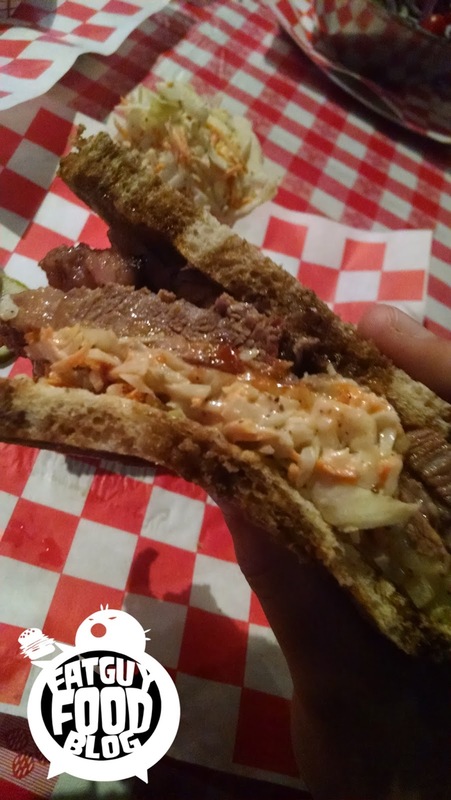 The brisket was juicy, flavorful, and tender, and was complimented quite well by the peppery-semi-sour coleslaw, and sauce Pitboss. While it was a great sandwich, I really should’ve seen through this shallow facade before I ordered. There’s a reason why pastrami usually comes with pastrami, because it’s probably the best meat paired with the other elements. The brisket was great by itself but altogether, it just didn’t really belong. I’m going to have to stick this Soulfire experience with a C+, the plus coming as a direct result of that really excellent barbecue sauce. Maybe if the fried mac was a bit more cheesy, I could’ve chalked up my Reuben disappointment to a poor ordering decision on my part. But, as what should’ve been an easy home run ended up being a ground-roll double, it left this reviewer skeptical of the restaurant’s other offerings. Alas, eat and learn. 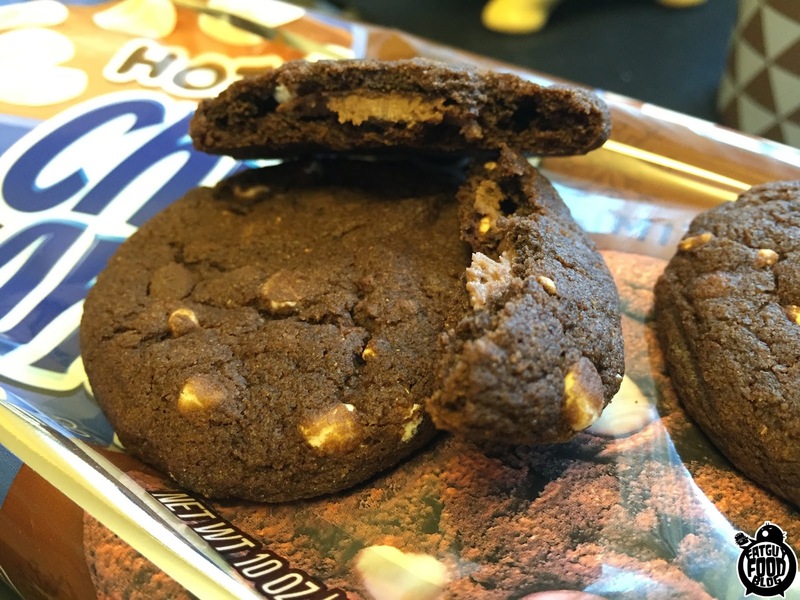 Hot Cocoa Chips Ahoy cookies! Hot cocoa is kind of a weird flavoring that has gotten more and more popular over the past few years. I mean, as cocoa, it's always been popular, right? But recently we've seen companies make hot cocoa (or hot chocolate, whichever way you say it) start using this as it's own stand alone flavor. 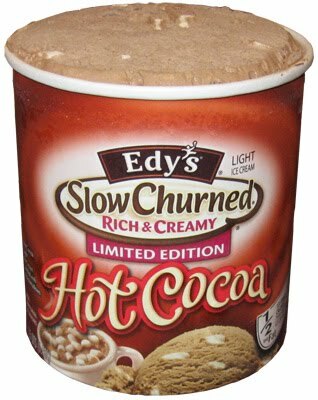 Edys has a hot cocoa ice cream, M&M's have a hot chocolate flavor, and even those gross marshmallow abominations, Peeps have a hot cocoa version. 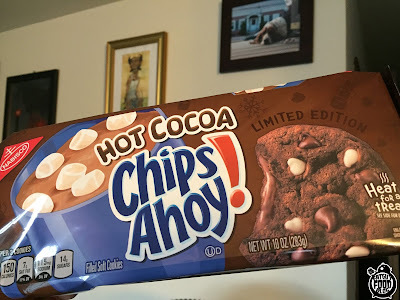 So it was only a matter of time before the cookie game got wise to this fad and so we find ourselves about to review the limited edition, Hot Cocoa Chips Ahoy Cookies! First off, I'll be honest, like I am every time I get stuck reviewing Chips Ahoy cookies. They usually aren't that good. Come on! You all know it. They are weird little discs of sweet chemicals. No part of them taste like they actually came from food. But somehow they are still a popular name in cookies. People like weird fake stuff! Well, I'm sad to tell you, these really don't break the mold. 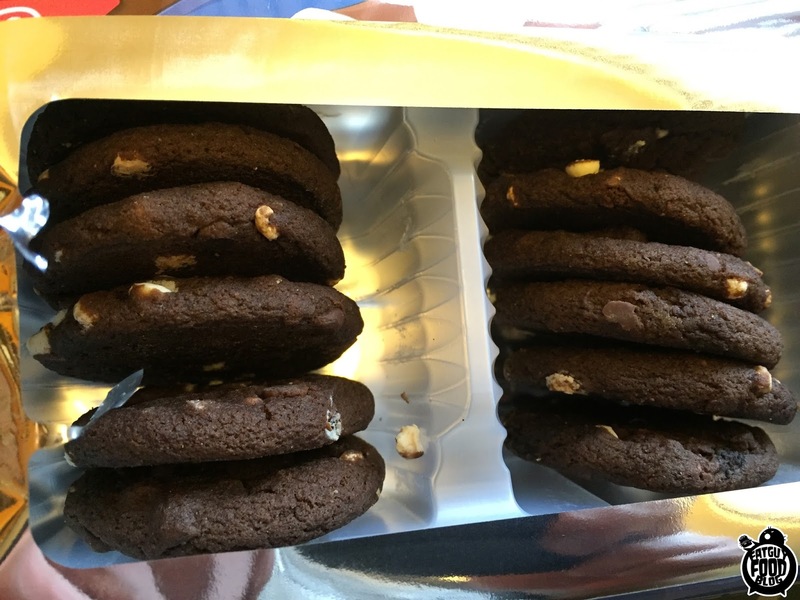 These are basically the same old chocolate Chewy Chips Ahoy cookies. BUT this time around they added some weird hot cocoa flavored cream in the middle, and in addition to chocolate chips, now the cookies also have little mini marshmallows. In case you're wondering, no, they aren't normal marshmallows, they are the strange kind that come in hot cocoa. The crunchy, almost Lucky Charms type marshmallows. These aren't terrible. They are tiny so you can pop one in your mouth. It has a slight crunch to it from the marshmallows and the cream inside definitely helps smooth it out. But after about three or four I put them away unimpressed. Do they taste like hot cocoa? Yeah they do nail the flavor pretty well. But how weird is that? These are flavored like a drink that was made to artificially taste like chocolate. So this is an artificially flavored cookie, flavored like a drink that's flavored like chocolate. Mind blowing stuff right there. But a day or two later when I grabbed the bag to give these a second go 'round, I noticed a little blurb on the bag telling you to heat them up in the microwave for a treat. I'm always up for a treat so I popped a few in. They say 6-7 seconds. 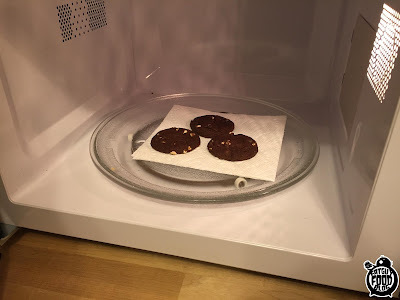 My microwave laughed at that and I left them in for about 20. As I figured, this improved them greatly. Much like the time we roasted Chips Ahoy over a camp fire, these instantly jumped up a couple letter grades with a little bit of heat. 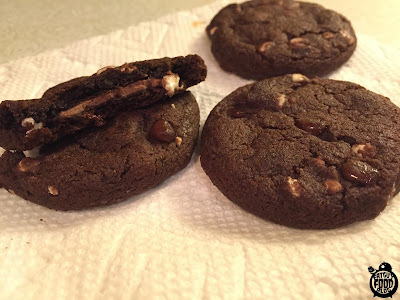 Suddenly they were melting and gooey and felt more like a real cookie. In fact, if you find yourself buying a bag of these to experience them for yourself, please put the entire package in the microwave and eat them like that. You'll thank me. In the end I have to say I wasn't very impressed by Hot Cocoa Chips Ahoy. They nailed the flavor, but they still just aren't great. Heated up they were definitely better, but I think I would rather take the money from this package of cookies and buy one REALLY good cookie from a local bakery instead. As always, feel free to drop us a line if you think of something you'd like us to review! Are you a company looking to get your product reviewed? Tell us! Do you know about the best restaurant in your town and want us to review it? Let us know! EAT OUT WITH YOUR MEAT OUT: The Green Elephant in Portsmouth, NH. We here at Fat Guy Food Blog venture into many a culinary world in our travels. I heard recently that humanity may all be the same soul, living out separate lives, experiencing countless things, and since time is not linear, we're all experiencing the world all at once, all one big entity writhing on top of one another for some mysterious, divine end. I'm not sure if I buy that, but I do believe in trying new things. That brings us here to The Green Elephant in Portsmouth, NH. I'm an idiot blogger and didn't even get a facade shot! Thai inspired vegetarian food, located in the newly renovated downtown. 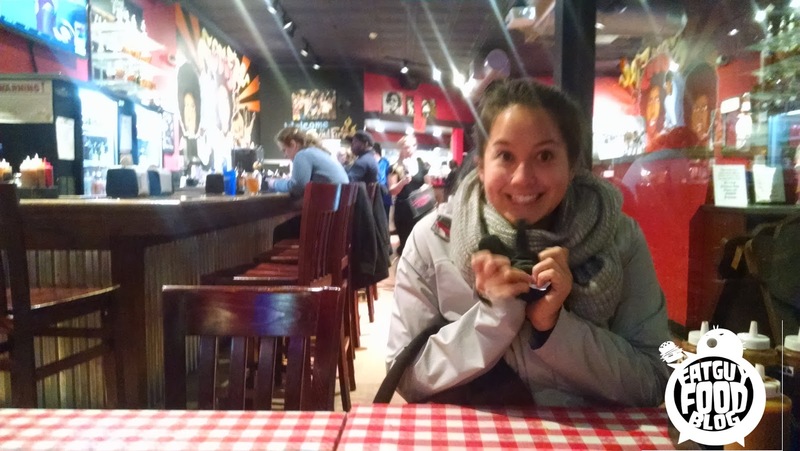 I was somewhat excited to try this place. A few friends of mine exclaimed how good it was. As life long vegan and vegetarians, I figured their broccoli and wheat grass stained taste buds couldn't tell a grown man what was good and what wasn't! So I hit the bricks with the lady in tow, and ventured out to see what was so good about The Green Elephant. 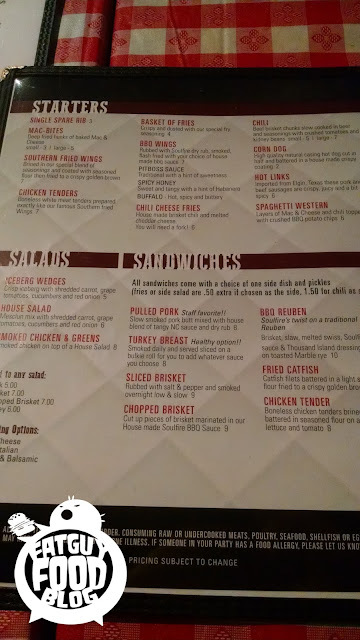 Looking at the small menu, I was somewhat relieved. A typical Thai (or Thai inspired) place has menus as long as my leg, so going about and finding something was relatively easy. We settled on an appetizer of Hot & Spicy Soy Sticks in a garlic chili cilantro sauce. Now, imagine my shock when this got sat down onto my table. These have to be insanely good for them to be able to justify only having 2 correct? Well to answer that question, they were... pretty good. These little soy fake meats on a stick were prepped so well you'd swear they were just sliced off a weird exotic animal. The sauce was spicy, and delivered that sour sweetness you'd come to expect with anything labeled "Hot & Sour". 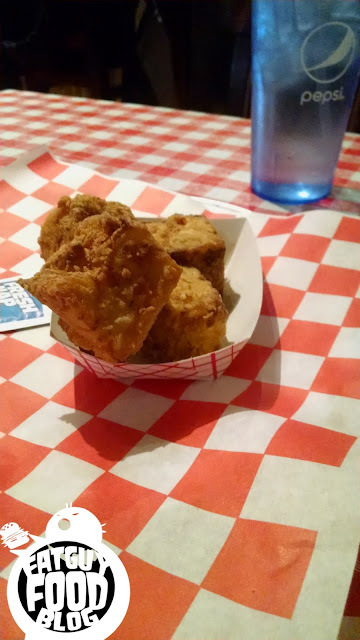 It had a delicious, almost reminiscent of baked chicken skin, outer wonton type, casing. The bamboo "bone" in the middle tricked my carnivorous brain into thinking I was eating animal flesh, and didn't once make me wish it was anything other than what it was. The appetizer was good, but I'm still sitting their unfulfilled, and that's what appetizers are supposed to do, whet your appetite, and prime your body for proper ingestion of the main course. So I went with their style of Pad Thai. Something I'm familiar with at other places, of course it'll be good right? You can also ask for your own level of spiciness, and me, not wanting my whole meal ruined if they went too heavy with the spice, went for a 3 out of 5. The Pad Thai went as expected. Large portion, ingredients fresh and separate, not a stew of Pad Thai in peanut sauce like I'm used to. The peanut sauce was not as sweet as I would prefer, and I 100% regret not upping the spice level. The 3 was definitely pretty weak. The Rice noodles were cooked perfectly. Not the best Pad Thai I'd ever had, but not the worst either. After I finished my bowl of food, there was something definitely missing. I didn't feel insanely full or heavy by the amount of food that was delivered to my table, which I SUPPOSE is a good sign. 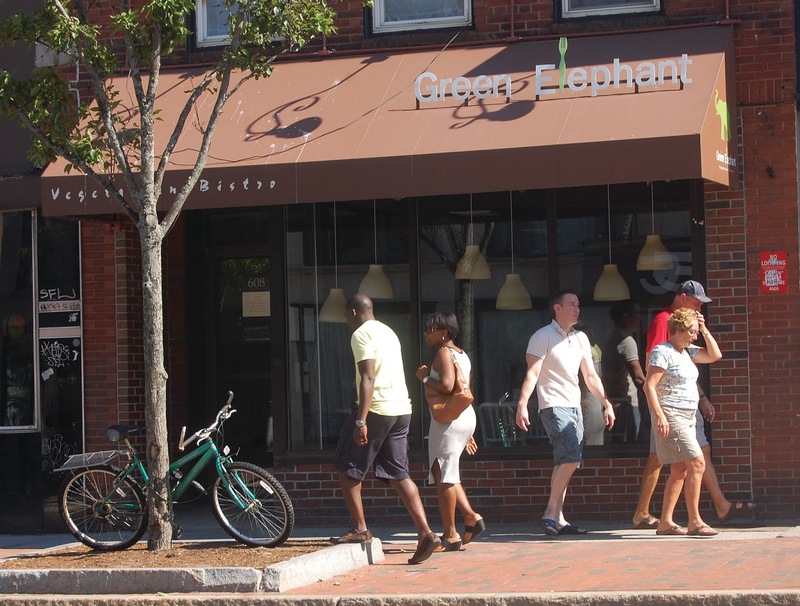 In the end, The Green Elephant wasn't anything phenomenal. The price tag was high, even for food that is served and prepared this fresh. I'm glad a decent vegetarian option is out there for my friends, but I hope they don't alienate themselves from regular folk by having higher prices than a standard Thai place, which do offer similar things, but maybe not as "healthy". I'd go back if they had a cheaper brunch option or something of that sort. It's nice, clean, fresh, and decent food. But nothing I tried really stood out as incredible. Slightly pricey if you're looking for a nice dinner, extremely expensive for a quick lunch. More of a place you'd go to impress a date, but not really go because you dig it. I would have bumped them up a full letter grade if they gave you more than 2 Hot and Sour Soy Sticks. That's just ridiculous. Throughout the meal sitting there, out of the corner of my eye, my inner fat guy just kept stealing glances out of the window, perhaps wishing he was another one of his past life soul tentacles, biting into something infinitely more delicious. The Holiday season has begun to descend on the snack world like a winged beast blocking out the sun. Every store has begun filling a large percentage of their floorspace with holiday cheer. Red, white and green shiny crap that we all buy up like lunatics because we all get caught up in the manic insanity that is December each year. The upside to all this? Well, aside from presents and making great memories with friends and family, is it's a great time for new versions of classic candy! 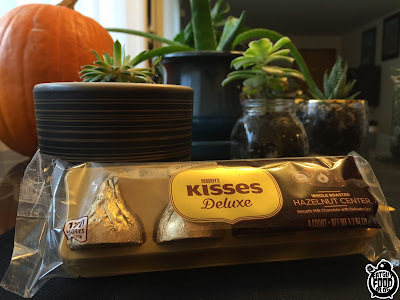 Much like these here...HERSHEY KISSES DELUXE! Yes, I found these quickly walking through a holiday aisle. Trying not to actually let my brain register that I was surrounded by Christmas stuff. I was just scanning for something new and suddenly these jumped out to me in all their golden glory. So what's the deal with them? Well, first off, they are GIANT. 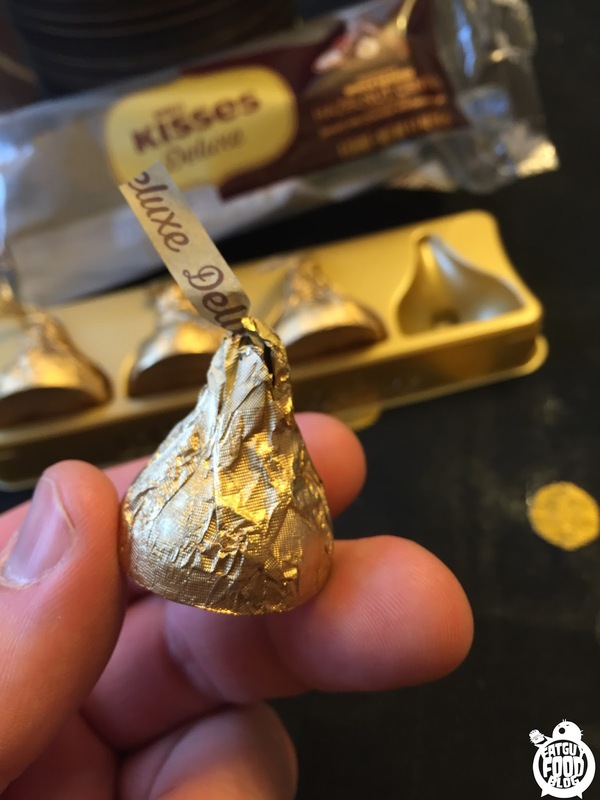 At least twice the size of a regular Hershey Kiss. These boast that they are "Smooth milk chocolate with delicate crisps and a whole roasted hazelnut center." You know what that sounds like to me? Ol' Hersheys wants their own version of Ferrero Rocher chocolates! Haven't had them? Look them up. They are damn delicious and something I get every Christmas morning from my Mom, and have for years. They are so good that I worry that if I ever had a never ending supply of them, that I would die from eating them. That's a serious concern. So now that we know what they are up to, does the Hershey Kiss Deluxe live up to this? Yeah! They are different, but they are quite delicious. 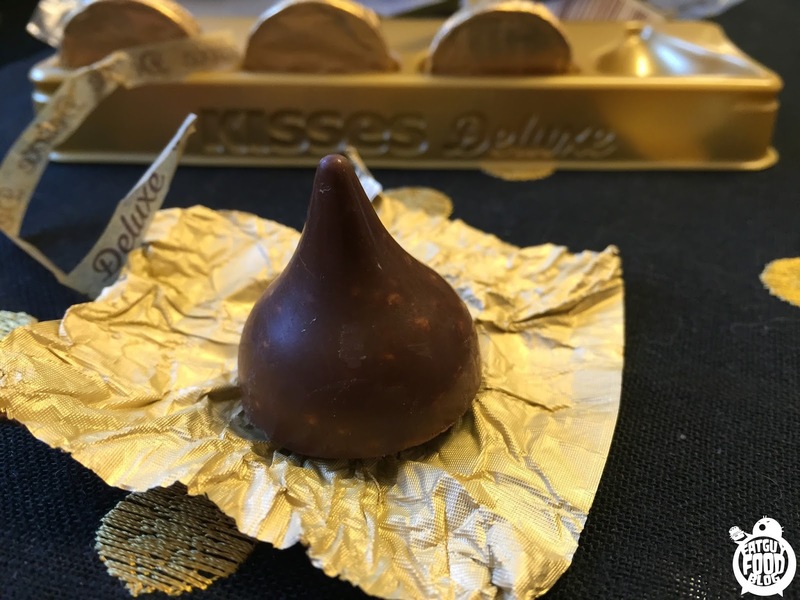 Picture this: a giant Hershey Kiss that has little crispies all through it, and in the middle is a big crunchy hazelnut that gives a satisfying pop as you chomp into it. 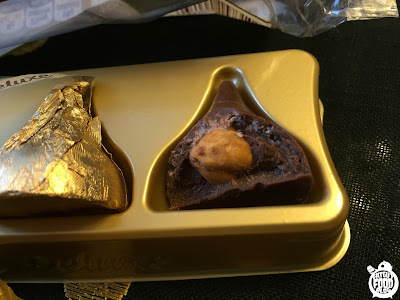 The chocolate is smooth and tasty, and it almost bursts with flavor as you chew up the pieces of hazelnut and the little chunks of crisp rice. A wonderful golden wrapped holiday treat. I'm not sure if these are limited edition or not, but to be on the safe side, you should definitely scoop some of them up. They come in packs of four, but are also available in big gift boxes that have a ton more. A perfect stocking stuffer for that chocolate lover on your holiday shopping list. Or, hell, buy a bunch and put them in a candy dish like you would normal Kisses, just to weird out your guests. I'm giving Hershey Kisses Deluxe a solid B rating. They are clearly trying to be Ferrero Rochers, and they don't quite get there, but they are still pretty damn awesome. 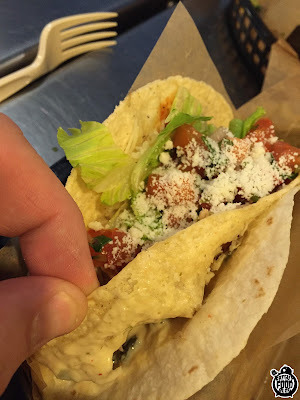 Qdoba Knockout Tacos! 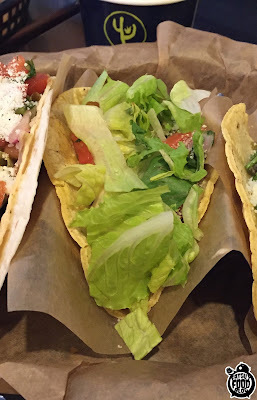 WHICH OF THE SIX WILL WIN IN THIS TACO THROWDOWN?! 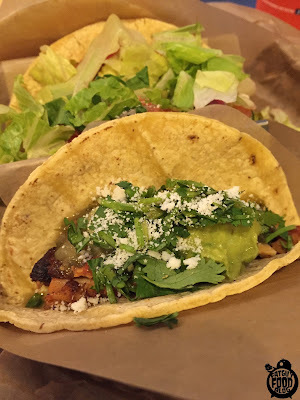 We recently got a couple of emails from readers wanting us to review the new Knockout Tacos from Qdoba. 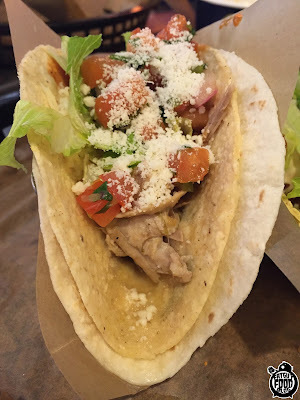 So with our endless list of high up contacts in the world of food, we managed to get directly in touch with them and asked if they might have some more information they could send along about the Knockout Tacos. A couple days later I get the best package that we've ever gotten from a company in the mail. Why? BECAUSE IT WAS FILLED WITH INSANE STUFF! 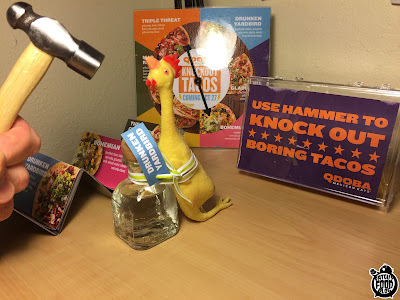 Not only did I get my very own taco stand, a Knockout Taco spinner, a hammer, and a rubber chicken, but also? TEQUILA. Can't go wrong there. There's one other awesome item that came in this box, but I'll save it for the end of the review. Keep your eyes peeled. But now it's time to put on my referee shirt once again, to call the six way match between these competitors. 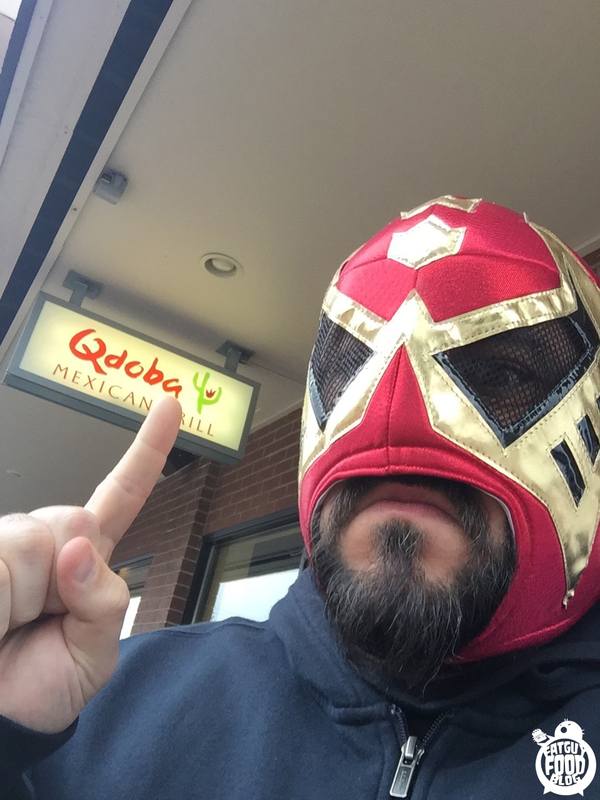 Get ready, ladies and gents, FOR THE Qdoba KNOCKOUT TACOS Battle Royal! After dunking a few chips into the cheesy goodness of the queso, it was time to spin the damn wheel! Up next is the The Triple Threat! 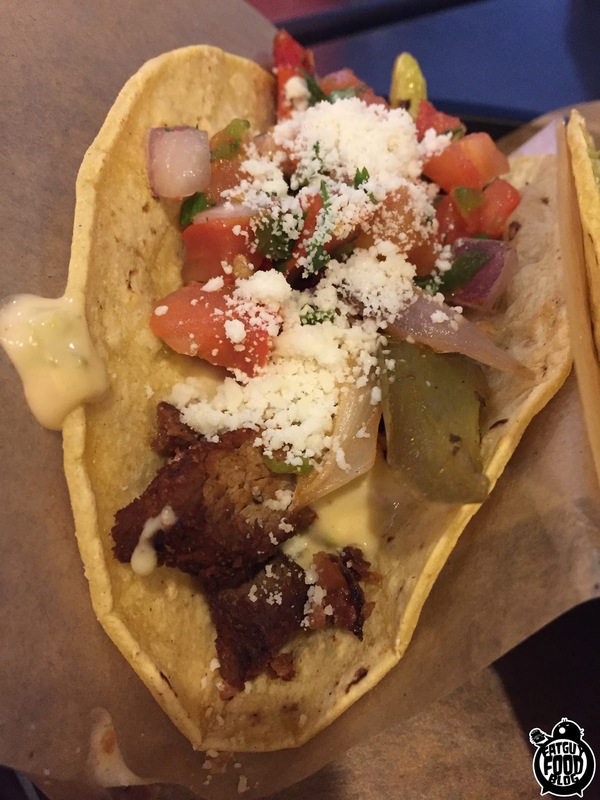 This taco has grilled steak, bacon, 3-cheese queso, fajita veggies, pico de gallo, and cotija cheese. This one was a fun medley of flavors. 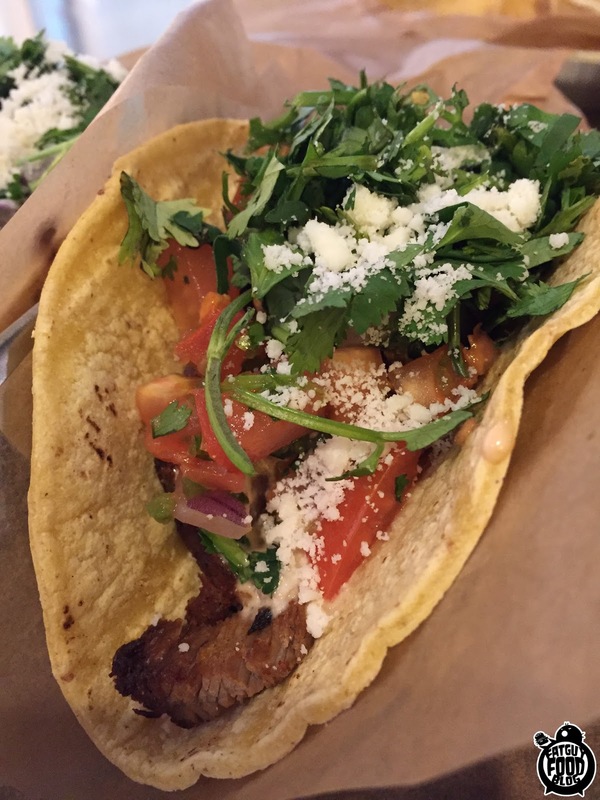 The steak is okay, but the main thing that pops out is the fajita veggies. This one was pretty much dominated by the flavor of the peppers and onions. 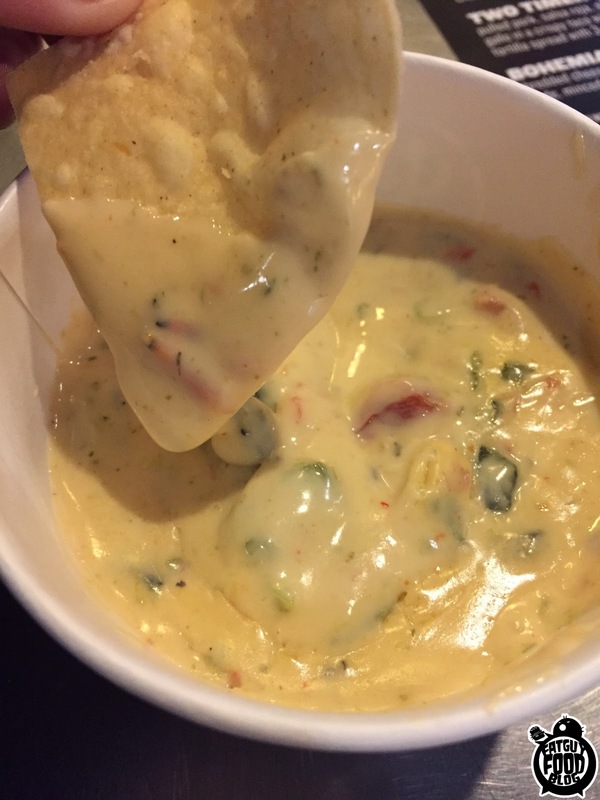 I think the queso is a neat addition that leaves a nice creamy cheese aftertaste too. Triple Threat beats out the Mad Rancher with ease! One quick side note, cotija cheese? Never had it before this week. 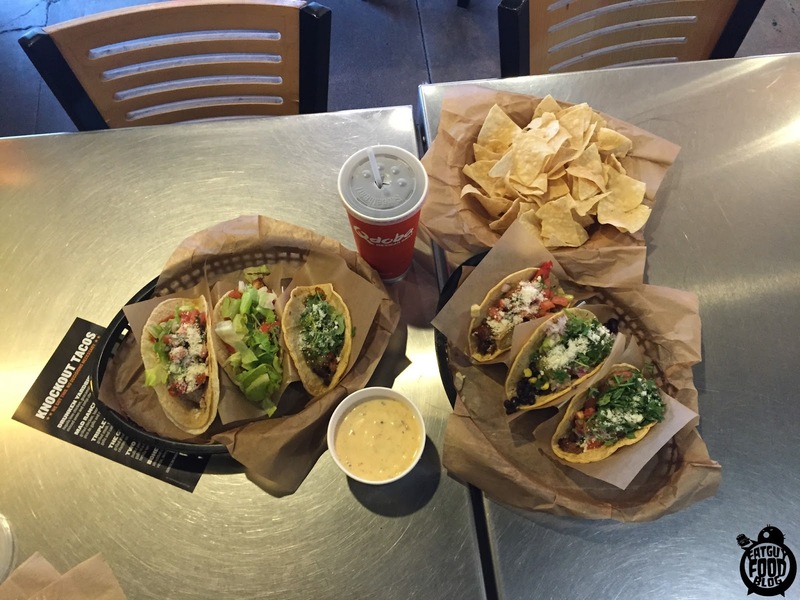 Qdoba LOVES this stuff. You can tell because it's on nearly every one of these. It's kind of an intense flavor too that when you taste it alone, you think it might be too much. But it ends up taking a back seat to the other taco flavors, luckily. Let's move on! The Gladiator! By name alone this one should be the winner. On the Gladiator you get grilled steak, bacon, pico de gallo, lettuce, Caesar dressing, cilantro and cotija cheese. The Gladiator definitely delivered in the bacon department, unlike the Mad Rancher. This one had a very unique flavor from the rest. The Caesar dressing stood out big time and took center stage. It was almost like a steak and bacon Caesar wrap. Can't go wrong with that at all. The Gladiator did a great job of entertaining my taste buds and is a definite contender to win this slobberknocker. Next contender to step into the ring? THE DRUNKEN YARDBIRD! 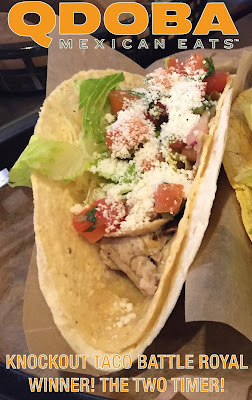 The Drunken Yardbird is tequila lime chicken, guacamole, salsa verde, cilantro, minced onion and cotija cheese. This one had a very tangy flavor throughout. I think it was a combination of the flavoring from the chicken and the salsa verde together. It was heavy on the cilantro too, but overall decent. The guac really shined through on this one too, and for guac fans, just so you know, theirs is not a chunky guac,(which I usually prefer) but it was still great. But does the Drunken Yardbird have what it takes to beat five other taco competitors? Doubtful. BY GOD IT'S THE TWO TIMER! The Bohemian Veggie! 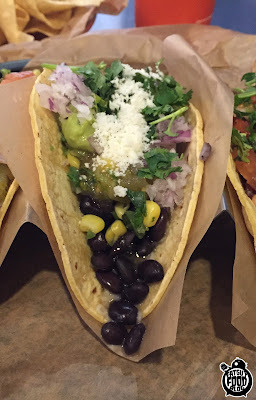 This one has shredded cheese, black beans, corn salsa, guacamole, salsa verde, minced onions, cilantro and cotija cheese. 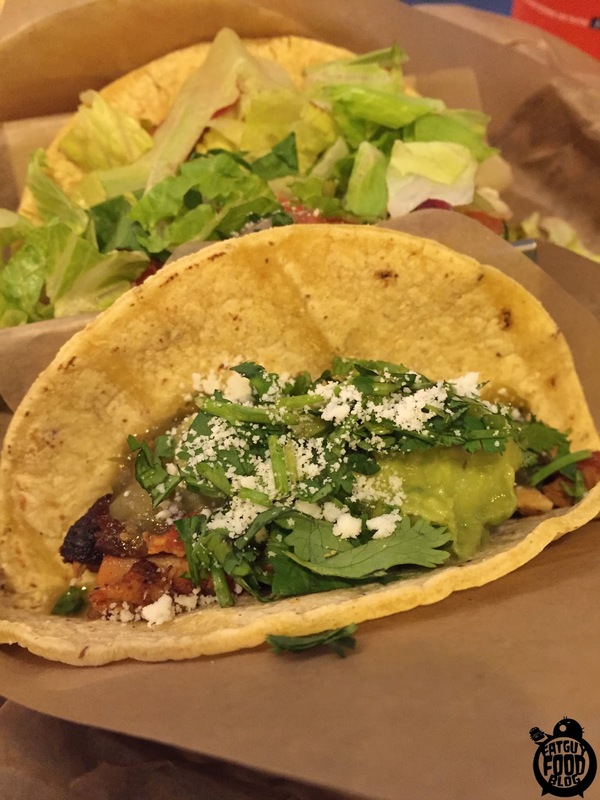 It's basically all the stuff that isn't meat from the other knockout tacos tossed into one. It tastes very fresh because of the fresh veggies and salsa, but it's also like biting into a water balloon. There's so much liquid from the veggies and all the different salsas that it tries it's best to explode all over you the second you try to eat it. Eating this was like taking a bite of a really good taco and then realizing that you didn't get any of the main part of it, so you peek back inside to see where you went wrong. Good flavor, and if you're a vegetarian and enjoy plentiful black beans, you just might like this. COULD THIS POSSIBLY BE OUR WINNER? HAHAHAH. You think Fatguyfoodblog is going to crown a veggie taco the winner? NOT WHILE I AM CALLING THIS MATCH! The Bohemian Veggie gets disqualified for being too damn wimpy. There's a clear winner here and it's the Two-Timer. 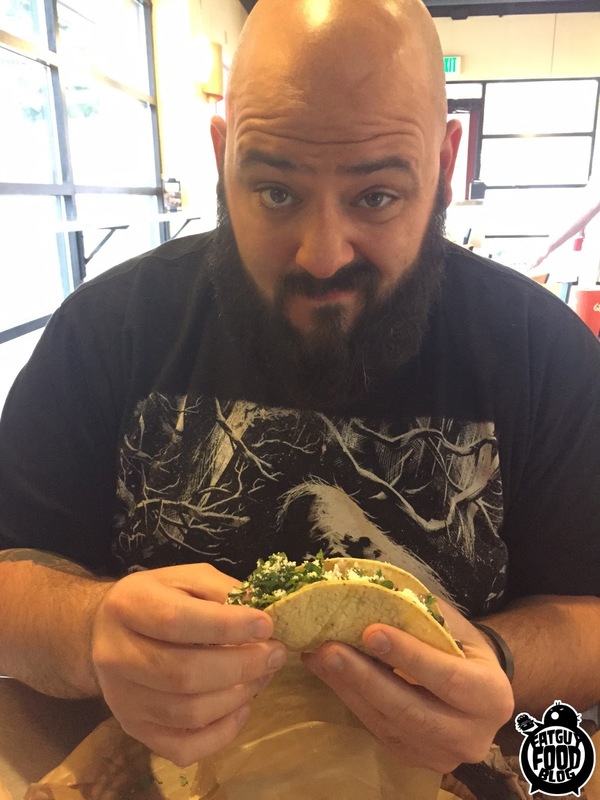 He single handily took out five other taco competitors with ease and pinned them all, 1-2-3. I proudly declare the Two-Timer the winner of the Qdoba Knockout Tacos Battle Royal! Thanks for reading folks. If you need me, I'll be practicing my hurricanranas and moonsaults in my back yard. Hoping to debut in Chaotic Wrestling this summer. 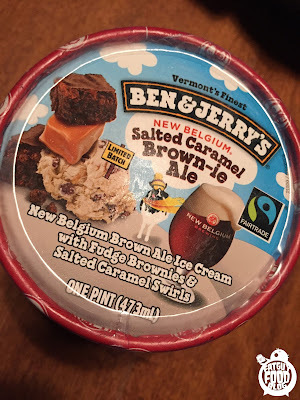 Ben and Jerry's Limited Batch: New Belgium Salted Caramel Brown-ie Ale ice cream! It's been a while since we've been able to get our hands on a limited batch Ben & Jerry's. So long, in fact that when I saw this one in the freezer section I plucked it out so fast that I hadn't even really registered what it was. "SALTED CARAMEL BROWNIE....Wait...BROWN-IE...ALE?" Yep. This is the latest from those insane flavor wizards in Vermont and this just might be THE weirdest flavor they have ever done. But is it good weird, or bad weird? Let's find out. Ladies and Gents, I give you, The Ben and Jerry's New Belgium Salted Caramel Brown-ie Ale ice cream! There's a lot going on with this label. Soak it all in. BEER ICE CREAM. The idea of beer flavored ice cream is not one that excited me at first. I just couldn't imagine a way that it could be good. I've never taken a sip of a beer and said to myself, "Damn, imagine if there was ice cream flavored like this?" It's just unnatural. But I guess that's what makes ol' Ben and Jerry special because they know how to think outside the box. So they teamed up with Colorado based New Belgium Brewing and created one of the weirdest ice creams ever. This has New Belgium Brown Ale ice cream with fudge brownies and salted caramel swirls. There's a lot going on here and I have to tell you...it's pretty damn good. Irwin was unsure about it, but in the end he wanted to taste that caramel swirl. When you first taste the ice cream you really don't taste much of the beer flavor. But a few moments later it hits you as a pleasant aftertaste. Seriously, it's great. Just tasting the ice cream part, it's basically what I would imagine a beer ice cream float would be like. I know people do this, but I have not had a chance to try it so this is a foreign concept to me. Right off the bat I was sold on at least the ice cream itself. Like sweet beer you eat with a spoon! 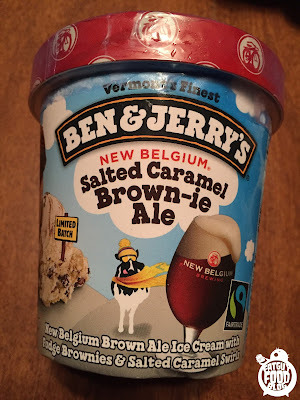 I think this was a great way to do this ice cream because I think beer lovers will enjoy the flavor, but I don't think it's so strong that if you don't enjoy the flavor of beer, you might still REALLY like it. The Brownie chunks are nothing special. They are those weird, fake, tiny brownie rectangles that you can find in other Ben and Jerry's ice creams. More like little chewy blobs. 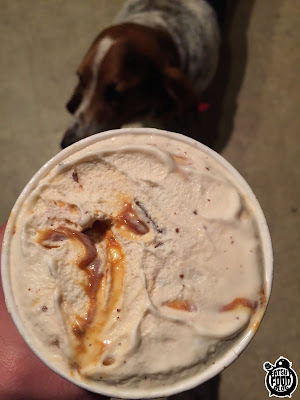 But the real star of this show is the Salted Caramel Swirls. Notice that it's "Swirls", plural. 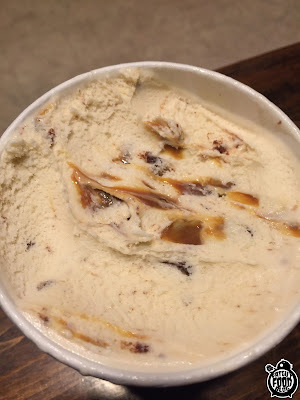 Because this ice cream is LOADED with gooey liquid caramel with that noticeable salty tang. Some parts had such massive deposits of it that I had to put some back otherwise entire spoonfuls would have been just that. Yup, this isn't one of those ice creams that hold back on the ingredients, there's a bounty of brownie chunks and salted caramel to be found in here! FYI: That caramel goes alllll the way down. I gotta say, every time I doubt Ben & Jerry's, they somehow blow my mind. I would have liked to have other pictures to go along with this review, but to be honest, I was so into it that the second time I sat down with this pint I finished it off and never looked back. It's that's good! That's why I'm giving it an A! I was weirdest out at the thought of it, but it ends up being a very complex, multi flavored medley that works on every level. I bow to the greater wisdom of the Ben and Jerry's flavor wizards. Now for those of you who ARE into beer, don't forget the flip side of this! New Belgium actually made the beer version! This team up between the two companies was to help raise awareness of climate change among the snow sports community through an organization called Protect Our Winters. Sounds like a worthy cause and just shows how awesome both of these companies are. Trying to make the world a better place while taking our taste buds on one hell of a ride. You can bet that the second I spot New Belgium Salted Caramel Brownie Brown Ale, I'll be picking up a six pack. How could I not?